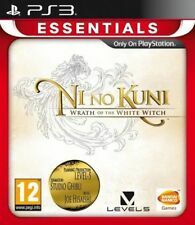 Ni no Kuni Wrath of the White Witch is an epic role-playing adventure centred from two legendary Japanase studios. Ni No Kuni. After being overthrown in a coup, the young king Evan sets out on an extraordinary quest to found a new kingdom, unite his world and protect its inhabitants from the dark forces that threaten them. disc scratching caused by hardware. Condition: New. Catalogue Number: 3391891995320. Ni No Kuni II 2 Limited Collectors Steelbook. The Making of Blu-Ray Disc. Lose yourself in the ultimate Ni no Kuni experience with this King's edition including The Art of Ni no Kuni II: An exclusive 148-pages artbook featuring concept arts from Momose-san and LEVEL-5. The Kingmakers: An making-of Ni no Kuni II on Bluray disc. Ni No Kuni II: Revenant Kingdom [PC]. 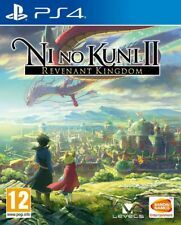 Ni No Kuni II: Revenant Kingdom - Kings Edition (PC). Lose yourself in the ultimate Ni no Kuni experience with this King's edition including The Art of Ni no Kuni II: An exclusive 148-pages artbook featuring concept arts from Momose-san and LEVEL-5. In very good condition! UK, Region 2. Complete disk, instructions and box. Ni No Kuni II: Revenant Kingdom, coupled with the brilliant graphical capabilities of Sony’s PlayStation 4 is sure to be yet another hit to a franchise that is gaining fans across the globe. Along the way, Oliver makes new friends and adopts many of the wonderful creatures that inhabit the world, raising them to battle other creatures on his behalf as he takes on formidable enemies. Ni no Kuni: Wrath of the White Witch. Used, like new. Loved this game, only selling as I completed it. This item isRegion Free, can be played on any Nintendo DS. 100% Genuine from Japan. EMS service for safety and smoothly. Especially t o.
Ni no Kuni Wrath of the White Witch is an epic role-playing adventure centred from two legendary Japanase studios. And when you do enter into combat,you'll be greet with even more dynamic visuals as the action plays out. On the watch list. Buy It Now. All the ingredients of an RPG and much more. Regionalcode PAL. An RPG from the forging of two legendary studios.